Home / Product / Dark Chocolate Dipping Chocolate (Wafers). Dark Chocolate Dipping Wafers can be used as a dipping chocolate, molding chocolate, or just a great snack. This premium chocolate wafer can be used in many different baking applications. Our Dark chocolate is a delicious, smooth and creamy milk chocolate flavored confectionery candy coating with no waxy taste. It is easy to melt and requires no tempering. If a thinner coating is desired, paramount crystals may be added. If adding flavors or colors, use a concentrated flavor or oil-based flavor. Variations in individual size, shape, color, and weight are normal. Chocolate may melt in shipping if ordering during warmer temperatures. If it melts during shipping, it can be remelted. Do not over heat, keep moisture out of candy. 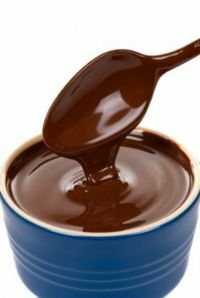 50-60% cocoa INGREDIENTS: Sugar, Partially Hydrogenated Palm Kernel and Cottonseed Oils, Nonfat Dry Milk, Cocoa Processed with Alkali, Cocoa, Glyceryl Lacto Esters of Fatty Acids, Soy Lecithin, and Salt. ALLERGENS: CONTAINS: Milk, Soy.